Softcover, 9 1/2 in. x 6 1/4 in. The protracted trial of Sacco and Vanzetti was the most controversial political event of the 1920s. Today, more than seventy years after their execution, the events surrounding the case of Sacco and Vanzetti are still the source of debate. Truly, it is the "case that would not die." Surprisingly, of all the books that have appeared over the years concerning the case, the most complete and convincing was first published in 1928, only a year after the execution of Sacco and Vanzetti. 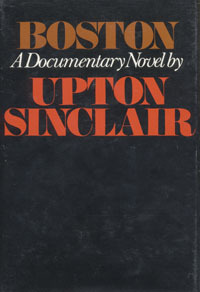 That book is Upton Sinclair's Boston. In his "documentary novel" the celebrated author of The Jungle combined a firm grasp of the facts of the case with an engrossing fictional framework to produce a remarkably accurate and comprehensive report of the events that spanned the years 1919 to 1927 which ultimately focused the attention of the whole world on a drama played out in the drawing rooms, courts, and streets of the city of Boston. In Boston, Sinclair described the xenophobia and paranoia that led the upper crust of Boston society to see these two illiterate immigrants as a threat to their way of life, and led to their conviction on the flimsiest of evidence. Sinclair used his considerable skills to arouse the reader to a state of outrage as the protagonists' inevitable fate approaches. The modern reader will perhaps be surprised to discover that Boston is a novel with the sweep and power of the city itself, a chronicle of the malevolence, greed, fear and corruption of social and policital leaders and institutions of the times. The chief fictional character of Boston is Cornelia Thornwell, widow of a former governor of the Commonwealth, a Boston brahmin directly descended from the Mayflower. At sixty-one she becomes the "runaway grandmother" a runaway from the vapidness of her large and quarrelsome family and from the closed world of her social milieu. But Boston is also a skillful amalgam of fiction and real life and Upton Sinclair's most notable achievement is in his realization of the characters of the principal actors in the Sacco-Vanzetti affair. Boston has been out of print for decades. Now this elegant reprint edition provides fresh insights into the case that shows the dark underside of the "Roaring Twenties." Included are 32 rare photographs, the Report and Recommendation of the Taylor commission to Governor Michael Dukakis clearing the names of Sacco and Vanzetti, and a bibliography.